Are you the guy or gal in the crowd that loves to keep the barbecue grills embers burning all year round? Are the chilly winds and their ability to blow out your fire the only thing you hate about barbecuing in the winter? If so, weve got news for you. There are ways to instantly setup wind breaks that wont help burn your house down in the process. It all starts with a very special tarpaulin. Well, perhaps its better known as a fiberglass welding blanket. Youll find them on offer now at Canopies and Tarps. Our Insul-Shield Fiberglass Welding Blankets come in a beautiful shade of white that will undoubtedly match that snowy landscape youll be working in. However, thats certainly not what makes it such a perfect wind break resource for chilly barbecue fans. This special tarpaulin can withstand an amazing amount of heat, up to 1100 degrees Fahrenheit to be exact! So you wont have to worry about the sparks, splatter and heat emanating from the barbecue grill causing it to melt into a hot mess. Of course youll still want to keep it an appropriate distance away from the grill for safetys sake. Thats not all there is to love about our Insul-Shield Fiberglass Welding Blankets. They are 60-Mil thick, weigh 24-ounces and come in a surprising array of sizes. Therefore, depending on your backyard barbecue setup, you may only need one or two to keep the winter winds at bay. The smallest tarpaulin is 3-inches by 4-inches, which may be enough to keep those small kettle grills burning into the night. The largest one is 12-feet by 20-feet. As such, it should be big enough to protect monster size smokers and propane grills with their own built-in side burners and shelving units. To learn more about them and other special tarpaulins that we have in stock, please contact us today. This entry was posted in insulated tarps and tagged concrete blankets, insulated tarps on January 22, 2015 by CanopiesAnd Tarps. When most people think of pop-up tents, parties and outdoor festivals come to mind. Although youll find our wares at places like those, they aren’t the only ones. Youll also run across them at camps deep in the American wilderness. The one that tends to show up in those places the most often is our APEX Base-Camp Tent with Sleeping Rooms. Capable of accommodating a party of four, it is 144-square foot of prime real estate thats ready when people need it the most. So it doesn’t matter if SHTF and its needed for a doomsday bug out bag or an impromptu camping trip with family and friends, our fully functional tent will have your lodging needs instantly covered. Its the kind of convenient pop-up tent that comes with its very own wheeled carrying case. Once folded up in the bag, the tent condenses down into a neat, 40-pound package thats 9-inches by 9-inches by 53-inches in size. Consequently, getting it from one location to another is a breeze even for people with moderate arm strength. 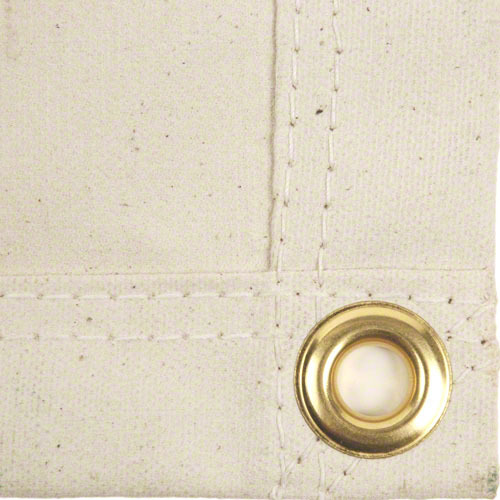 Worried that it wont offer enough protection from the sun, wind, rain and biting insects? Dont be. This beautiful, roomy pop-up tent is made from fire-retardant, UV-blocking, 300-denier polyester and premium aluminum. Youll also find vented peak x-scape, Honeycomb-Truss technology, reliable guy tie-downs and sturdy spikes in place. Plus, theres a good 74-inches of head space available too. The other thing weekend campers and doomsday preppers love about our base-camp pop-up tents is its interior layout. The fully screened and vented interior features a 64-square foot gathering area and a pair of 40-square foot sleeping rooms. The sleeping rooms each feature their own seamless floors, zippered entrances and mesh-covered windows. So sleepers will have a modicum of privacy and no worries about rain water or moisture dampening their sleeping bags. To learn more about the APEX Base-Camp Tent with Sleeping Rooms and other pop-up tents that can help house people when the time is right, please contact us. At Canopies and Tarps, were not just about parties. Were about emergency shelter, truck tarps, greenhouse kits and other temporary structures too. This entry was posted in pop up canopies and tagged pop up canopies on January 22, 2015 by CanopiesAnd Tarps. Do you love to attend those community events where everyone gathers in a park or parking lot to watch movies outdoors, under a star-filled sky? Have you always wanted to replicate the experience at home but were stopped in your tracks once you saw the cost of home theatre systems? If so, weve got part of a solution that may help you achieve your cinematic goals in time for spring. It all starts with our untreated canvas tarps, a paint roller kit and a few cans of a very special paint. Known in home theatre circles as screen paint, it is manufactured by a variety of companies. Among them are BEHR and Goo Systems. By all accounts, this type of paint is great stuff to have around if you want to create a DIY theatre. Basically, the untreated canvas tarp gets spread out onto the ground and painted using the products that we just mentioned. Be forewarned though, depending on the canvas tarps size, you may need more than one can to achieve the right amount of coverage. Oh, and by the way, make sure that whichever color paint you choose, its flat and not semi-gloss or gloss. Otherwise, you could end up with an annoying glare. Once the paint dries, the canvas tarp may be hung up wherever you want your DIY theatre to be. Afterward, simply focus your projector onto the recently painted tarp and ta dah!, instant cinema fun for whole family. Talk about insanely easy! 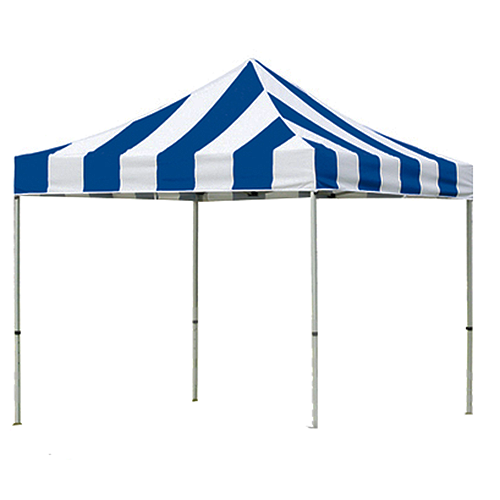 Of course you may want to add a party tent, pop-up tents, portable chairs, mesh sidewalls and collapsible tables to your canvas tarp order too. After all, it would be nice to give guests a place to sit, grab refreshments, escape the mosquitoes and chill out during intermission. For assistance finding just the right size products for your DIY theater needs, please contact us at Canopies & Tarps today. This entry was posted in canvas tarps and tagged Canvas Tarps on January 21, 2015 by CanopiesAnd Tarps. How creative are you feeling right now? If the answer is Very, you might want to grab one of our high quality, affordable, untreated canvas tarps and channel your inner DaVinci or Martha Stewart. 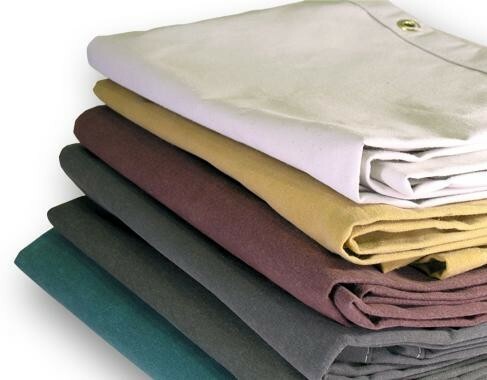 What do Martha Stewart, Leonardo DaVinic and canvas tarps have in common? The answer is really simple. Both DaVinci and Martha have a history of painting on canvas. The major difference between the two is that the Grand Dame of DIY Household Crafts used her final creation as a spiffy-looking, canvas rug. Yes, we said a rug. You can find photos of her DIY canvas rug project and a complete set of instructions online. And in case you are wondering, Martha Stewart isnt the only one that has ever created a custom designed rug from an untreated canvas tarp. There are several bloggers that have done so too. Just check out Positively Splendid, Pinterest and Pop Sugar, then youll see what we mean. Oh, and by the way, you dont have to stick with just custom rugs. Your DIY artwork could be hung on the walls, double as curtains or help separate rooms as well. We should also mention that the creative folks over at Pop Sugar came up with another solid idea that you may want to try. They have figured out how to use canvas to turn digital photos into artistic prints. The prints would be perfect for art displays inside homes and business. In their published project, they used ready-made stretched canvas but you dont have to. 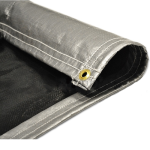 Our affordable, untreated tarps could easily be cut up, stretched across frames and used in the same way. Just make sure that you follow their instructions for preparing the surface. Otherwise, the finished product wont last long. 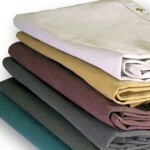 To learn more about untreated and treated canvas tarps, please contact us today. There are some extreme sports enthusiasts in this world that can afford to leave the cool weather behind whenever they want and head out in search of some warmer waves or a sunny concrete bowl. Of course then there are the rest of us, who cant get away from the chill without inheriting a serious amount of cash and a leer jet. The good news is those of us in the latter category can make do with a collection of affordable, blue tarps. If you dont already have a collection, you can start one by visiting our online store. Once you have the tarps on hand, getting ready to surf is a quick and easy task. Just spread it out on a flat surface and place concrete blocks or rocks on two of the tarps four corners. Then convince a handful of likeminded sports fans to grab the tarps two open ends and run towards the blocks every time you hop onto your longboard and roll across the great, blue divide. The end result is the look and feeling of being caught inside of a barrel wave, well sort of. We know that nothing can truly replace the rush of adrenaline that comes from tackling the worlds biggest barrels or super pipes but its a good place to start. Its also a fun way to create some ultra cool photos and videos to share on your social media accounts. Understandably, youre going to need a variety of cameras to get the best tarp surfing shots. The list of good choices includes, but isnt limited to GoPros HERO2 through HERO4. They frequently come with your choice of mount (e.g. helmet or board). 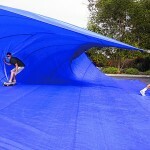 To learn more about the fun of blue tarp surfing, please contact us at Canopies & Tarps. 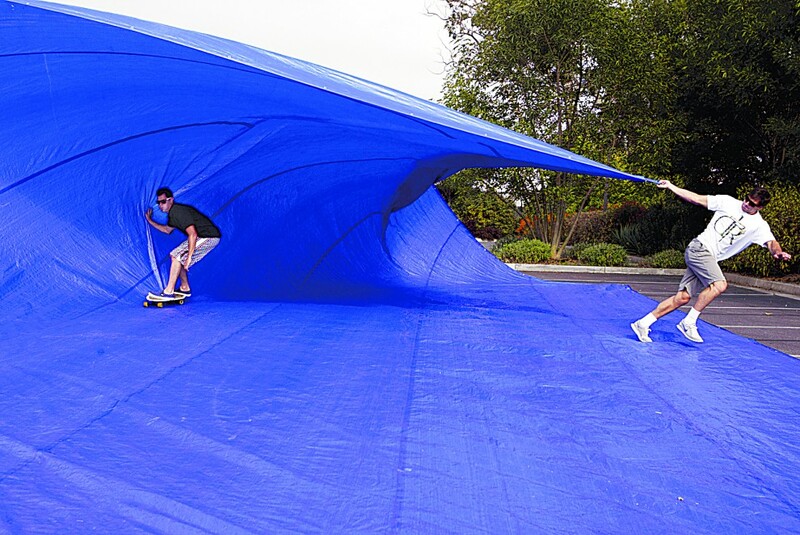 We have a large collection of heavy-duty, high-quality surfing tarps in stock that are sure to please street and park skaters alike. This entry was posted in Tarps and tagged tarp surfing, tarps on January 14, 2015 by CanopiesAnd Tarps. Valentines Day isnt just for lovers. An increasing number of singles are celebrating the holiday too. Many do so by hosting a special dinner or dance for all of their single friends and family members. If you are looking to do the same in February 2015, wed suggest buying party tents now. That way, there will be no doubt that youll get the tent you need and have plenty of time to set it up before the big day. Because the holidays roots trace back to Roman times, it may be fun to host a toga party underneath of the tent. Even if you live in a cold climate, this is still possible as long as you also invest in a portable heater. 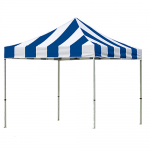 There are several on the market that may be used with fireproof or fire retardant tents. If you do decide to go with a Grecco-Roman theme, consider decorating the party tents interior and exterior with greenery. It was a popular form of decoration during the times. Most craft stores across America sell faux garland that may be conveniently utilized for such purposes. Of course youll also want to think about buying some extra greenery for the creation of laurel wreaths and crowns. If youve never made one before, theres a great DIY video on Pinterest that may help or you may just want to buy wreaths readymade. Either way, they should add a bit of dramatic flair to your Valentines Day party for single ladies and gents. At Canopies & Tarps, our knowledgeable staff is prepared to help Valentines Day event planners like you select party tents large enough to accommodate all expected attendees. We can also help you place an order for foldable, plastic banquet chairs and long, rectangular tables. To speak with a staff member and discuss the specifics of your Valentines Day order, please contact us today. This entry was posted in party tents and tagged event tents, party canopies, party tents on January 14, 2015 by CanopiesAnd Tarps. Making purchases for your home to ensure you are prepared for emergencies and other situations can be an exciting experience, but making the right purchases can be challenging. An addition that you should take into consideration isvinyl tarps, which provides many uses for completely different situations. Instead of placing your tent directly on the ground when camping, you can use a vinyl tarp to keep your tent in the best shape possible. It is also an excellent method to keep it easy to clean, which can be difficult to do when a tent is set up directly on the ground and at risk of getting muddy. While you can paint carefully to keep paint from getting on the floor, you can also use vinyl tarps to cover the area where you are painting to prevent this from happening. It is an easy and reliable solution to a potentially frustrating and time-consuming problem in trying to get paint out of your flooring. During fall and especially in winter, your backyard can get really cold, sometimes to the point where your plants are simply unable to handle the drastic temperature drop. Fortunately, you can use a vinyl tarp to cover the plants that are most sensitive in the wintertime and keep them alive until it warms up. Although you should try to get roof leaks looked at as soon as possible, you may be in a pinch for a quick solution while you wait for a professional roofer to get to your home and inspect the situation. Using a vinyl tarp allows you to cover the leak and prevent rain from penetrating the leak until it gets fixed. While these may be some easy and helpful ways to use a vinyl tarp, there are many other situations in which you can use one to your advantage. Pleasecontact usfor more information on vinyl tarps. This entry was posted in vinyl tarps and tagged tarps, vinyl tarps on January 5, 2015 by CanopiesAnd Tarps. Spending time outside can sometimes be disrupted due to the beating sun or unfortunate weather, which can cause people to reschedule their original plans or attempt to make the best of the situation. A better solution is to usecanopiesto eliminate the sun or weather-related problems by providing plenty of coverage that protects everything and everyone under the canopy. Whether you are working on an outdoor project or simply trying to enjoy the outdoors, a canopy can come in handy to use in your backyard in numerous scenarios. For instance, you may be throwing a family get-together and want to provide your family members with a shady place to enjoy their delicious food. Although you can generally check the weather report to determine what the weather will be like, weather can change quite drastically while on a camping trip, and this is where having a canopy can prove to be extremely helpful for staying protected from the sun and harsh weather conditions. Canopies are easy to bring along in a vehicle and can be stored in small places, so there is no need to worry about reserving a large amount of space to add this helpful item to your camping experience. 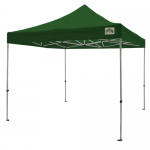 Oftentimes, special events occur outdoors where the weather can have an enormous impact on the entire event, but having a canopy allows you to stay protected. Instead of dealing with extreme heat, rain, or the chance of getting sunburned, you can use a canopy to avoid these problems and focus on enjoying the event. If you are interested in getting a canopy for outdoor use,contact usfor more information. This entry was posted in canopies and tagged canopies on January 5, 2015 by CanopiesAnd Tarps.